I will buy literally any comic that Paul Grist cares to produce. That's not an exaggeration: If he wants to do Doctor Who comics? Sign me up. If he has an eight-page backup story in a comic book I don't read? It'll be the first one I buy. That dude could do an adaptation of Transformers 3 with Michael Bay co-writing it and I'd not only pre-order it, I'd tell everyone I know to do the same. The man is on my list. And he got there by creating my favorite comic -- not my favorite independent comic, or my favorite comic that's not about Batman, my favorite comic -- Jack Staff. 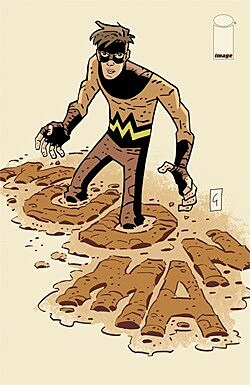 So when it was announced that his next project would be creating a new super-hero in a book called Mudman, it'd be an understatement to say that I was interested, and a lie to say that I wasn't also a little apprehensive. After all, if you're as big a fan of Grist's as I am, then the first thing you're going to notice about Mudman is that, well, it's not the next issue of The Weird World of Jack Staff, the latest series starring Britain's Greatest Hero, Becky Burdock: Vampire Reporter, and the other assorted characters that Grist built an incredible comic around over the past 11 years. For the die-hards, it's easy to see that fact alone as a strike against it. 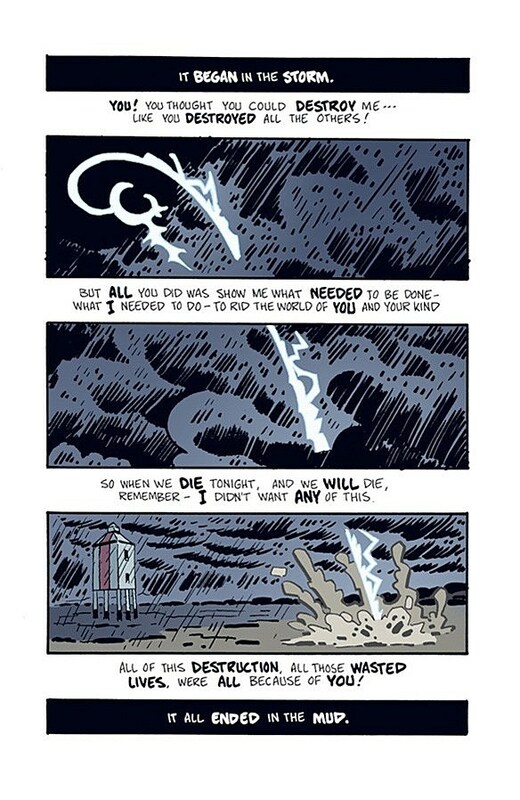 In Jack Staff, Grist created something that was everything super-hero comics could and should be, a single book that introduced dozens of characters whose stories intersected in ways that were fresh and engaging, with an economy of storytelling that made "major" crossovers look like they were put together by amateurs. It was dynamic to the point where you really never knew what you were going to get in each issue, not only from the different characters and teams, but from the way those characters were presented. Hyperbolic 19th century-style playbill narration, police interrogation transcripts, excerpts from a fictional novel, even a character breaking through the fourth wall to play word games with the reader -- these were all things that Grist used to tell his story, occasionally going right through to the back cover to do it, and they worked beautifully. The end result was, and is, a master class in how to make super-hero comics that's still accessible enough to be read by anyone. Mudman, by contrast, seems to be really stripped down -- and despite my love of what Grist was doing with Jack Staff, that's not a bad thing. After a decade of working with Staff and his Weird World, it's really interesting to see what Grist does when he pares things down to focus on a single character and his story -- at least for this issue. There's certainly a chance that things could expand to match what he's done elsewhere, but at least for now, the hallmarks of that style are largely absent. The single shot that's divided into panels and the unknown narrator that may even be speaking directly to the reader are both very much in keeping with his signature style, but really, that's it. There is, however, a subtle twist to what Grist is doing that stands as a fairly subtle example of how he uses the page. His usual dynamic layouts are far more restrained than I thought they'd be, and instead, we're given a book with sparse, occasionally nonexistent backgrounds that draw the focus to the figures and faces. Grist's a good enough cartoonist that he doesn't just drop out backgrounds in order to save time, and in fact, there are times when he and colorist Bill Crabtree actually incorporate that negative space into their pages as part of the art. The overall effect is of things popping out, of the high points of the story being isolated and emphasized. It seems counter-intuitive, but the more mundane sections, like our title character washing his face, talking to his family and going to school, are all given full backgrounds. It's the parts that twist into super-hero territory as he deals with his new powers, those are the parts set against the crisp white background where the other details fall away. But overall, the story's told in a pretty straightforward manner. More than anything else, it reminds me of a book like Ultimate Spider-Man: A fast-paced introduction to Owen Craig, a teenager who stumbles into a set of mysterious super-powers and (quite literally) leaps into action with them just in time for the end-of-issue cliffhanger. Next to Grist's other work, it feels incredibly decompressed, and in a way, it is. But at the same time, there's a lot going on here that's refreshing. For one thing, Grist's story is completely free of manufactured angst. When we first see Owen, he's a out with a friend tagging signs and buildings, but it seems less like he's out to stick it to the man or because of a deep-seated resentment of his father, a policeman, than just your average teenage rebellion. 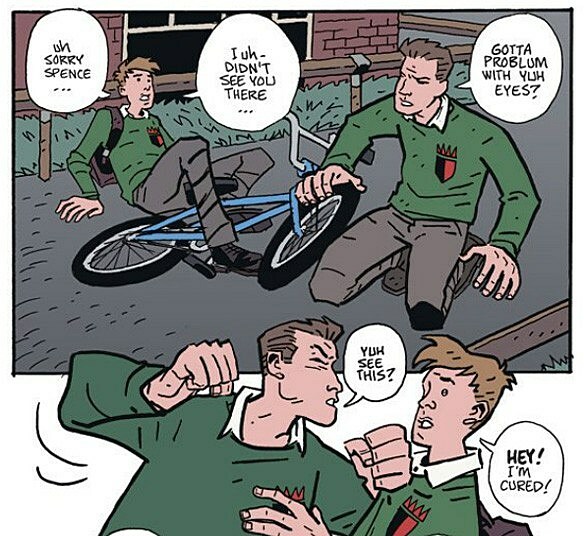 The same goes for a few pages later when Owen's going to ask his dad about the house he was exploring when he got his powers, and his dad asks if they can talk about it later because he has to get to work. It's such a ridiculously typical setup for a dramatic pause and a dark note of foreshadowing, but Grist just moves right along. It's not a Moment, it's just a moment. Even with that, it's played as a sort of sitcom situation that underlines Craig's relative weakness in his civilian identity, but without the crushing depression that comes from an attempt to cast a young character as living the overdramatic life of the typical teenager. There's no way that this book doesn't owe a lot to Spider-Man in general, but not to the point where it tries to ape that comic's knack for heaping drama onto its main character. While it's a straightforward story that moves quickly, there's a lot that goes on in this book. Grist has an understanding of the comic book as a single unit of storytelling that's better than anyone else working in comics today, and the economy that he's developed from year after year of packing his with dense stories have given him an ability that makes conveying so much information without drawing any attention to it seem easy. By the end of this issue, we know everything we need to know to have a handle on who Owen is -- it's only the super-hero stuff, the powers, the costume, the mysterious mansion, that gets left out, so that we can discover it along with him. 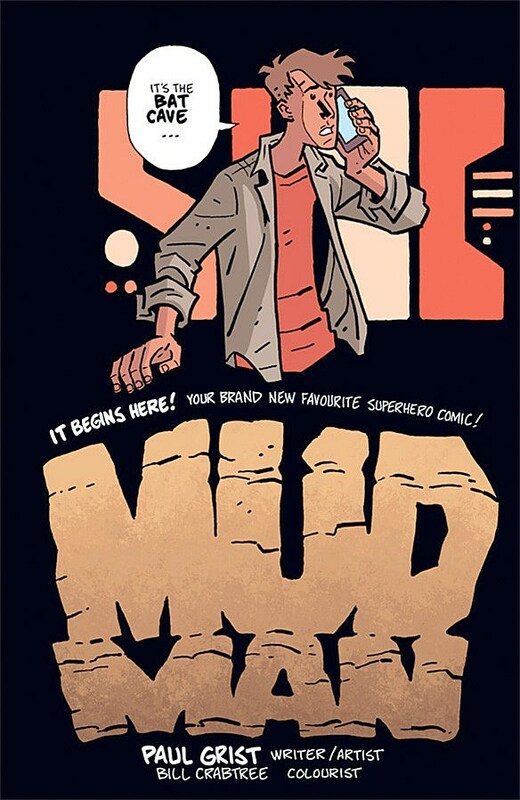 On the title page to Mud Man #1, Grist refers to it in his typical bombastic style as "your new favourite superhero comic," and I'll admit that it's good, but I'm not quite sold on it being that good yet -- I'm still pretty attached to Grist's last book. But it does have a ton of potential to bring his signature style, masterful technique and bold new ideas to the kind of story that most comics readers already love.